A graduate of the University of Minnesota, Emily Doyle pursued coursework in political science and gender studies, with an emphasis on social issues, gender justice, and discrimination. As an intern at the state capitol, she saw elected officials drafting legislation, but became increasingly impressed with the ways attorneys worked with legislators to help change laws. Recognizing the impact they could make she was motivated to pursue a career in the legal field. Passionate about human rights, Emily finds herself surrounded by like-minded colleagues at Halunen Law. 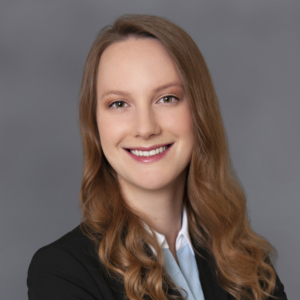 As a legal assistant, she provides important research, documentation, and other administrative support to Halunen attorneys and their clients. Outside of work she loves going out to eat with friends and experimenting with cooking at home. Emily hails from St. Paul and she and her family are avid tennis fans. She’s a seasoned player and also enjoys watching the pros. She’s been to Wimbledon and the French Open, with the U.S. Open and Australian Open next on her list!